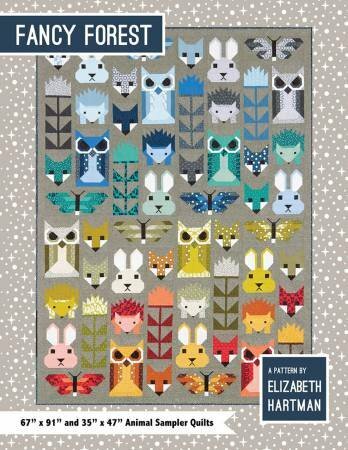 Fancy Forest is a delightful sampler quilt featuring some of Elizabeth Hartman's most popular block designs, including Fancy Fox, Hazel Hedgehog, Bunny, Allie Owl (in a new smaller size), Thistle, and newcomer Frances Firefly. The 67" x 91" Large Quilt is perfect for a twin bed or to use as a sofa/large lap quilt. The 35" x 47" Small Quilt makes a perfect baby quilt or wall hanging. All blocks are sewn with simple straight and diagonal seams. No templates or paper piecing! Printed in booklet form and perfect for fat quarter and fat eighth collections! Two Sizes: 35" x 47"